Pioneer WV Federal Credit Union’s 2nd Chance checking is right designed for those members who failed to qualify new checking at any other banks because of Chex Systems reports. The monthly service fee is $12. And the account can earn stated dividends if the balance is over $500. Started by several “pioneering” educators in 1940, Pioneer WV Federal Credit Union has $144 million in assets now, offering financial services to those who lives, works, worships in the counties of Greenbrier, Roane, Kanawha, Putnam, Clay and Fayette, WV. Unfotunately, I can’t find the checking at the credit union’s website now. 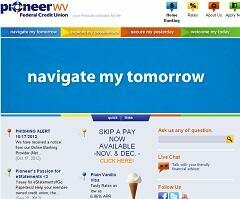 If you are still looking for new opportunity to open checking account, please visit other credit unions or banks in WV.